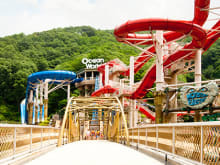 One of the great things about this park is that you can enjoy your time at the water park until you get tired and then treat yourself and your exhausted body at the spa! I will definitely go there again next summer! I tried a massage program at the therapy center. It was really awesome!! I felt like my body was renewed. Spa village was also a great spot to treat yourself. You can see a beautiful mountain view there. 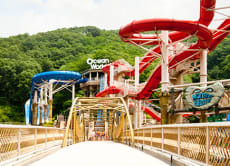 I spent a great time at vivaldi ocean park! My favorites were super boomerango and monster blaster in the dynamic zone. They feel just like roller coasters! It took me around 20 min to ride each time, but it was worth it! Even if there is a long line, you should try them at least once! The outdoor area is where the fun really is! At first, I was going to stay in the indoor zone to avoid getting sun burn, but we couldn't stay away from how cool the outdoor zone was. I got really sunburnt in the end! You should go early in morning, else the lines for the big rides will be too long even on weekdays but you can still enjoy many other rides.